This duo is a culmination of passion for the styles of music we both love. 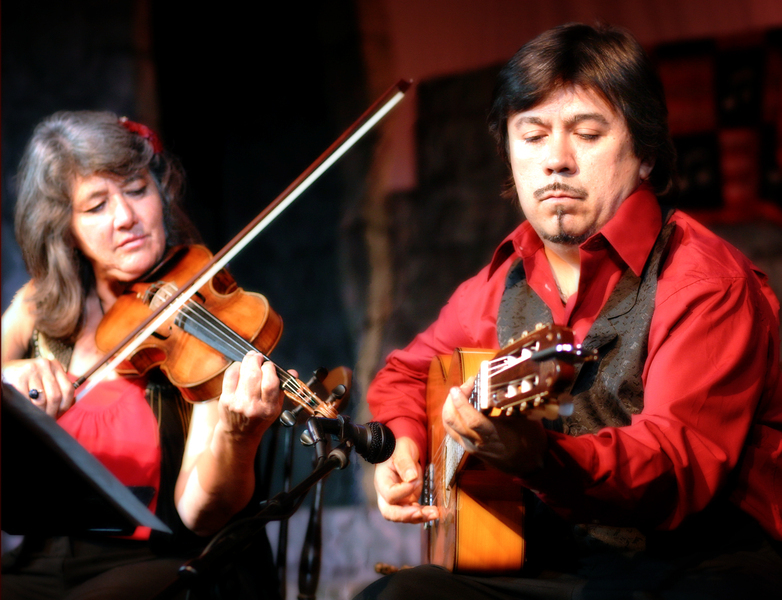 Our music represents a wide palette of styles including, Latin, French, Italian, Americana, and our own mixtures created in our own original compositions done with passion and romance. Jean Sudbury is a consummate violinist and mandolinist who offers an eclectic variety of music when she performs. She plays contemporary and classical music and loves the challenges of improvising and interpreting the music of the great masters. Her solo and section work includes concerts with small ensembles and big orchestras, recordings for TV and movies, and many compact disc collaborations with independent artists and composers. She has been fearured soloist on violin and mandolin with the Utah Symphony, the Pacific Symphony, the American Ballet Theater Orchestra, and other noted ensembles. She has performed at such places as the Universal Amphitheater, the Greek Theater, the Disney Hall, the Dorothy Chandler Pavillion, Warner Brother’s Studios, Capitol Records, Sony Studios, the Cicada Club, the Hollywood Bowl, and on the Tonight Show. “Infinitely expressive and technically dazzling,” (L.A. Times,) Jean’s music is a unique collection of life experiences. Ruben Ramos is an accomplished guitarist and bassist who has played worldwide alongside his home base in the Los Angeles area for all his life. Ruben has worked with The Ten Tenors from Australia, Jim Stubblefield of the group Incendio (Flamenco), Eddie Money, Mike Gurley of the band Dada, Luis Bonilla. David Hasslehoff, Patty Andrews, Bea Arthur, Burliegh Drummond (Ambrosia and Tin Drum). Ruben has performed at venues including The San Diego Civic center, Historic Dayton Ohio Victoria Theater, The Hollywood Bowl, The Wiltern, Alex Theater Glendale.